The MV Caribou Ferry loads up passengers and vehicles in the port in North Sydney, Nova Scotia to take another journey across the Strait of Belle Isle. The trip across the strait takes approximately five and a half hours once it departs from Nova Scotia until it reaches Port aux Basques in Newfoundland. The M/V Caribou Ferry (to Port aux Basques) at the Marine Atlantic Ferry Terminal in North Sydney, Nova Scotia, Atlantic Canada, Canada. 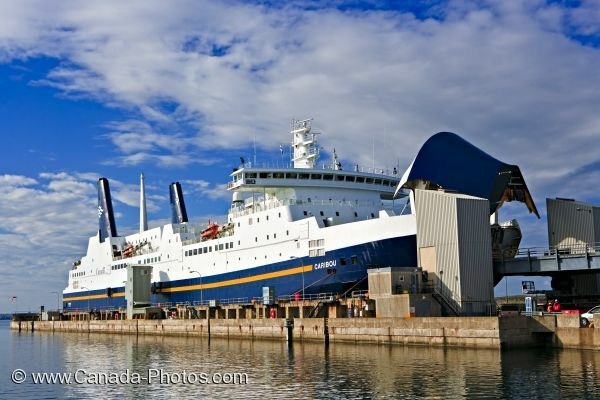 Picture of the Marine Atlantic Ferry, the MV Caribou docked in North Sydney, Nova Scotia preparing for its next trip.